INDELEASE has moved into new headquarters as part of plans to build on major growth. The company has more than doubled in size in just two years and director Oliver Smith says the switch to offices in Telford, Shropshire will create a strong platform for continued expansion. He added: “We’ve grown tremendously over the last two years – both in terms of the volume of business written and in physical size. “We’re building a strong reputation as trusted partners within the industry and demand for our services has never been stronger. “Now we want to build on that momentum and the new headquarters will give us the perfect platform from which to do that. The Central Park offices – three times the size of the company’s former base in Shrewsbury – were formally opened by the Mayor of Telford, Councillor Rae Evans. The occasion marked the start of a new chapter for Indelease, which provides contract hire, asset finance and fleet management for commercial vehicles. Oliver added: “We’re hugely ambitious as a company but we’re being careful to retain the attributes that set us apart. “We are much more relationship-based than most providers and like to embed ourselves in our customers’ operation. The wide range of services we provide will often complement each other and there are distinct benefits to that. A FAST-GROWING manufacturing company has become one of the first of its kind to launch a financial services arm for its truck and trailer divisions – thanks to Indelease. Priden Engineering builds bespoke bodies, handling and discharge systems and aluminium components for all types of commercial vehicles. Now the company has teamed up with our truck finance specialists to provide a package of white label funding solutions for its customers. 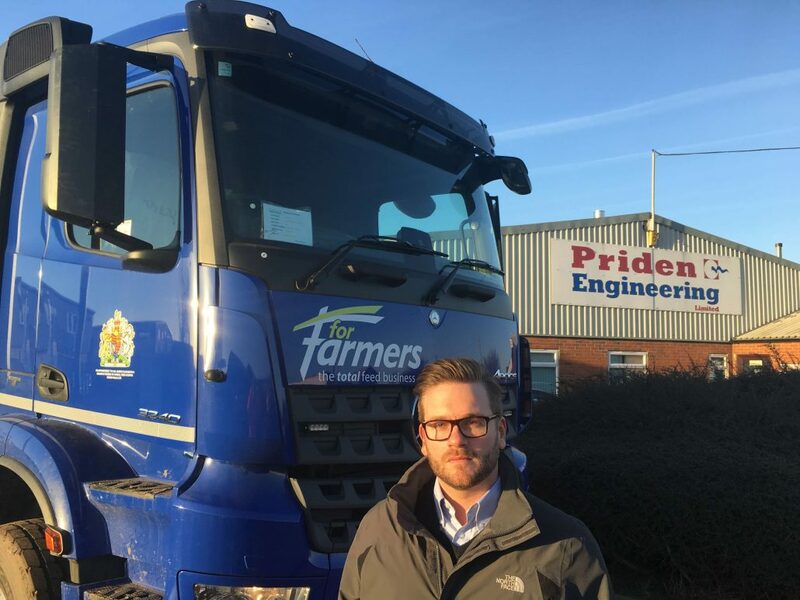 The launch of a dedicated finance section breaks new ground for Cambridgeshire-based Priden and operations director Kevin Walker is convinced it will deliver major advantages both to clients and the company. He said: “Providing financial services is new for us. I believe we’re one of the first manufacturers to do so and it’s a great addition to the range of services we can provide. “Finding the right contract hire or HP package can be a complicated and time-consuming business and that can be an issue for fleet managers or busy operators who don’t necessarily have the time to shop around. The collaboration with Indelease, which goes live for the first time this week, includes the provision of repair and maintenance packages and could soon extend to fleet management. Mr Walker added: “We want to become a one-stop shop for customers with commercial vehicle requirements and this is a major step towards that goal. “It enhances our overall proposition and reflects well on us as a company. Priden, first established in 1988, now has an annual turnover of £13.5m and employs more than 100 across three factories at its six-acre site in Wisbech. Contract hire experts Indelease specialise in providing a range of funding solutions for new or used vehicles and trailers. Finance director Oliver Smith said: “There are unique advantages to each method of financing new assets and it’s crucial to fully explore the options. “We have strong relationships with a vast number of financial institutions and are ideally placed to secure the most efficient and commercially appropriate solutions. POULTRY giant Faccenda Foods is renewing a fleet of delivery trucks at one of its main distribution centres in a bid to keep pace with growing demand for British meat. The company, which produces and supplies more than 200 million cases of chicken and turkey each year, says orders from supermarkets have never been stronger. And it has now moved to boost a vast logistics operation based at its state-of-the-art processing plant in Telford, which underwent a multi-million pound extension last year. The delivery of 29 Volvo tractor units, supplied by truck leasing and contract hire specialists Indelease, will play a key role in the delivery process. “We do have a previous relationship with Indelease, but this is the first time they’ve won our business to supply and maintain our trucks. They came up with the right deal at the right price and a service agreement that meets our requirement perfectly. Ian Ashley, Head of Transport at Faccenda Foods, said: “Demand for our British chicken portions has increased markedly over the last couple of years. “It seems the public still prefers products that have been produced in the UK and that’s great for our business. The contract, worth more than £3 million including both fleet management and maintenance, is a first for Faccenda – one of the largest food businesses in the UK. The company has a turnover of more than £500 million and employs more than 3,500 nationwide. Mr Ashley added: “This is a deal which enables us to replace some older trucks and add others to create a modern, safe, fuel-efficient fleet. “It gives us full control of our entire distribution process and means we’ll no longer use periodic rental or spot hire to meet peaks in demand. “They came up with the right deal at the right price and a service agreement that meets our requirement perfectly. The first of the Volvo FM 6×2 Globetrotter units was delivered to the site this week with the remainder to follow before the end of the month. They’ll have a vital role in a 300-strong fleet, which also features more than 160 light commercials along with 120 smaller vans and cars, delivering more than 200 million cases of chilled and frozen products each year. Indelease, based in Shrewsbury, has enjoyed stellar growth since it was launched in 2009, doubling both fleet size and the fleet management element of the business over the last 18 months. Managing Director Juliet Smith said: “Faccenda is a huge company that operates throughout the UK so we are delighted to have won the deal to supply and maintain their new trucks. “It’s a very significant deal for us and great testament to our credibility that such a highly respected business has such confidence in us.